In rotator cuff repair surgery, things are very different. In rotator cuff repair, the surgeon repairs the torn muscle tendon by tacking it back to the bone from which it tore. The tacking stitches are quite weak. The actual glue is made by the body. This scar glue takes a minimum of six weeks to form so that during that time the patient is not able to use the arm actively at all. This is because the surgeon’s tacking stitches are not strong enough to resist the pull of the muscle. If the patient used the arm, the repair would immediately fail. This means that every rotator cuff repair patient has to keep his arm in a sling or other immobilisation device, for six weeks. It stays there twenty-four hours a day, except when the patient goes into a shower to wash under the affected arm. He may not use the arm or hand for any activity at all, including cutting food or writing or using a computer keyboard. During that six weeks, though we need scar to heal the torn muscle, we do not want scar to form in other parts of the shoulder. If it did, then the shoulder would become stiff. To stop this happening, the shoulder has to be moved. 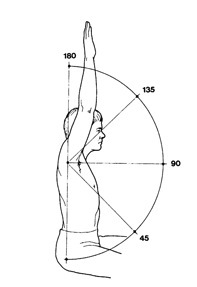 The patient is taught to do this himself, with the other arm to do the stretching. This occurs once a day, maintaining the range of movement, preventing glue and scar from forming in the wrong places. After six weeks, a patient is able to start moving the arm actively for himself, but for six further weeks, only very gently. It therefore takes three months before the scar has matured enough and is safe for normal day to day use. It is only then that one knows that the repair has been a success. From three months onwards, patients are able to get back to light day-to-day activities but heavy lifting is not allowed for nine months, if at all. The same applies to strenuous activities, such as golf and tennis. The results of surgery are proportional to three things: the youth of the patient; the quality of the tendon; and the size of the tear. Youth of Patient: Younger patients have a higher success rate and better healing than older patients. For rotator cuff tears, ‘young’ is 50, and ‘older’ is over 70. Though the rotator cuff can be repaired in patients over seventy years, research shows that the failure rate in this age group is much higher than in patients aged around fifty to sixty years. Surgery can be complicated in the first instance by infection and though this can be eradicated if picked up quickly, it certainly jeopardises the results of surgery and the repair may well fail altogether, purely because of this. Using keyhole techniques for the repair, infection is very unusual. Another complication is stiffness. We will work very hard to try and stop stiffness but some people just have an excessive scarring reaction to surgery and become stiff. This too, may jeopardise the repair as it is like trying to drive the car with the handbrake on. This will cause the muscle to tear out. The third complication is simple repair failure. In a proportion of patients at three to four months, as already outlined, the repair will have failed. The patient will have been through the six weeks of immobilisation and the six weeks of gentle rehabilitation and will not have a successful repair after it. Things can be salvaged with physiotherapy but in certain patients a failure occurs and there is very little that can be done about it. To reiterate, the failure rate is between 10% and 40%, depending on the factors already raised.